Sen. Tom Cotton was the first lawmaker to fly through the finish line again at this year’s ACLI Capital Challenge. 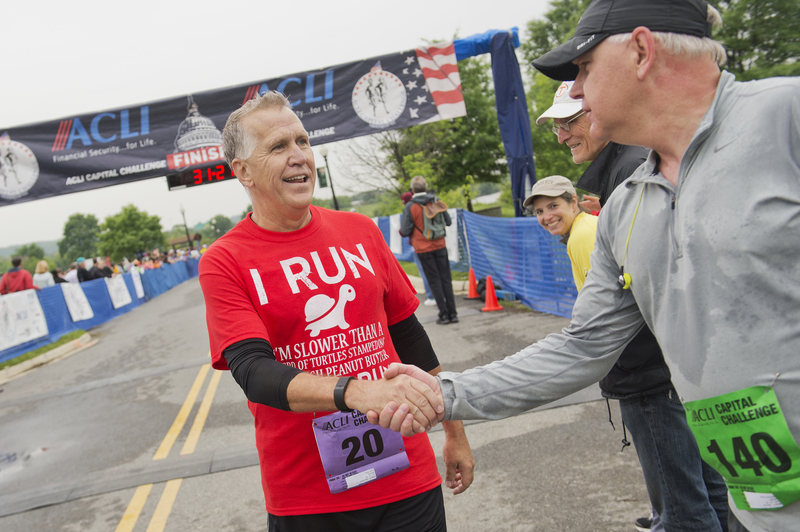 The American Council of Life Insurers hosted staffers from all three branches of government and the media for the 35th annual three mile race in Anacostia Park to raise money for the Fidelco Guide Dog Foundation. Not only was this year the fourth in a row Cotton was the fastest overall from Congress — he also won both years that he was in the House — his office team took first place in the team challenge. Although Cotton was difficult to catch, Texas Democratic Rep. Beto O&apos;Rourke was into his third mile before many runners made it through their first. Several staffers in “Davis” shirts ran alongside their boss, Illinois Republican Rep. Rodney Davis, while Sens. Kelly Ayotte, R-N.H., and Shelley Moore Capito, R-W.V., sporting a running skirt, ran solo. North Dakota Sen. Heidi Heitkamp walked the race with a partner while Sens. John Cornyn, R-Texas, Jack Reed, D-R.I., Thom Tillis, R-N.C., and Rob Portman, R-Ohio, all completed their three miles. House Whip Steve Scalise, R-La., had his normal entourage of staffers running with him, but one member for that, Sen. Charles E. Grassley, was not present this year . Other congressmen running were Reps. Tim Walz, D-Minn., Chris Gibson, R-N.Y., Tom Reed, R-N.Y., and newcomer Darin LaHood, R-Ill., as well as White House chief of staff Denis McDonough. Along with making guide dog partnerships possible, the race also featured Meb Keflezighi, an Eritrean-born American Olympian who won both the New York and Boston marathons. Keflezighi jogged next to runners and cheered several people on.